+ No synthetic perfumes<<<this is HUGE!!! Parents make hundreds of decisions about the health and happiness of their family each day. 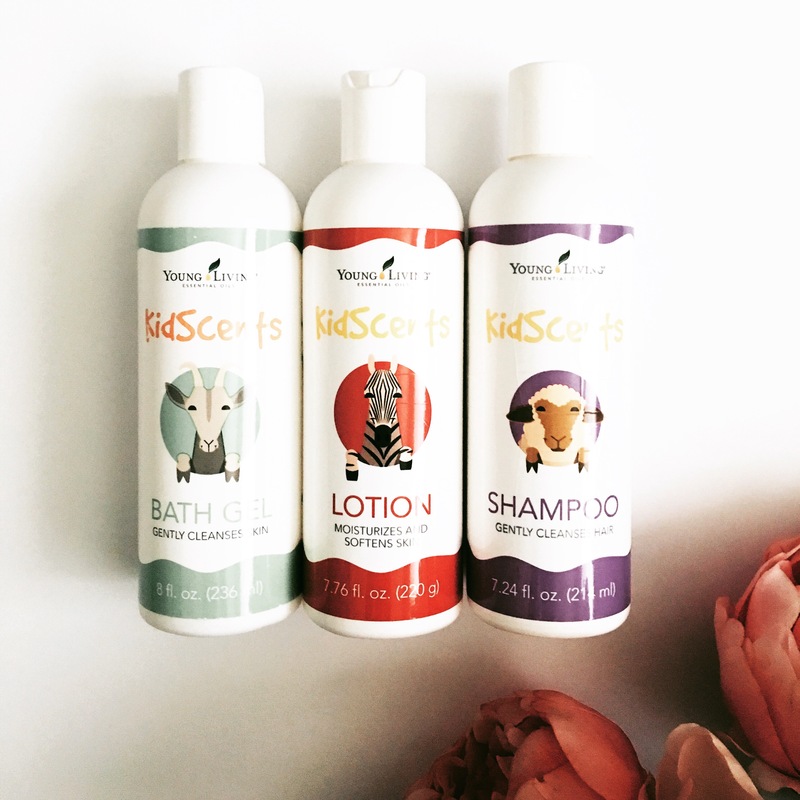 With so many products and promises to choose from, these products are designed to make it simple for parents to find pure, gentle products to care for their littlest, most vulnerable family members. 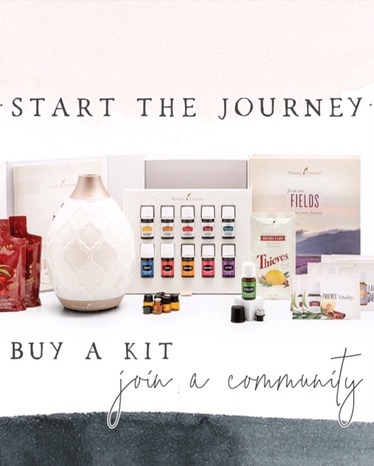 You will receive 25.00 back on your new YL account when you join my team TODAY! Do not delay! Let’s make some amazing changes happen for you and your family! 1. What Essential Oils are safe for baby? 2. 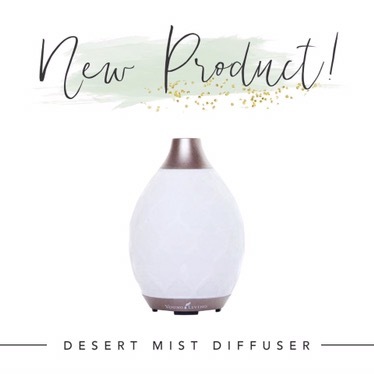 Is it safe to keep an Essential Oil diffuser in the same room where baby sleeps? YES! We love diffusing in the nursery for nap time and bed time! 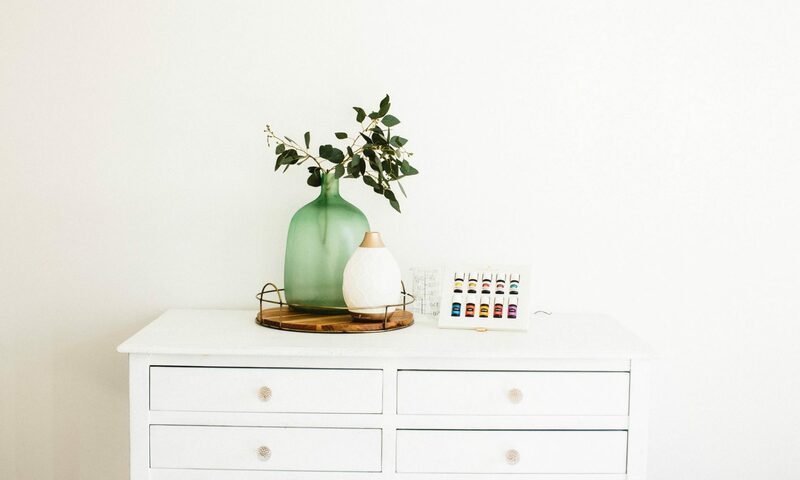 Diffusing helps create a calming, peaceful atmosphere that can help induce sleep. Breathing in essential oils directly influences the control center of the brain, the hypothalamus. This area sends instructions through our body concerning sleep patterns, mood, behavior, appetite, and the release of certain hormones. 3. Where are the best areas on baby’s body to apply Essential Oils? I started off applying eo’s on the bottom of my son’d feet. Place drops of oils into a bowl, in a roller, or in your hand and add your carrier oil, my favorite is either fractionated coconut oil or avocado oil. Always dilute when applying oils on infants and children. When beginning topical use, it is wise to start slowly on the bottoms of the feet and gradually test on other areas for sensitivity. Now my son is 7 months old and I roll his Lullaby roller on his feet, behind his ears, down his spine and on his chest. His Lullaby roller is 5 drops Lavender and 5 drops Frankincense topped off with FCO in a 10 ml roller, it’s perfect for calming and immune boosting! 4. Which EO’s are helpful for sleep training? Y’all need this oil, especially for kiddos! 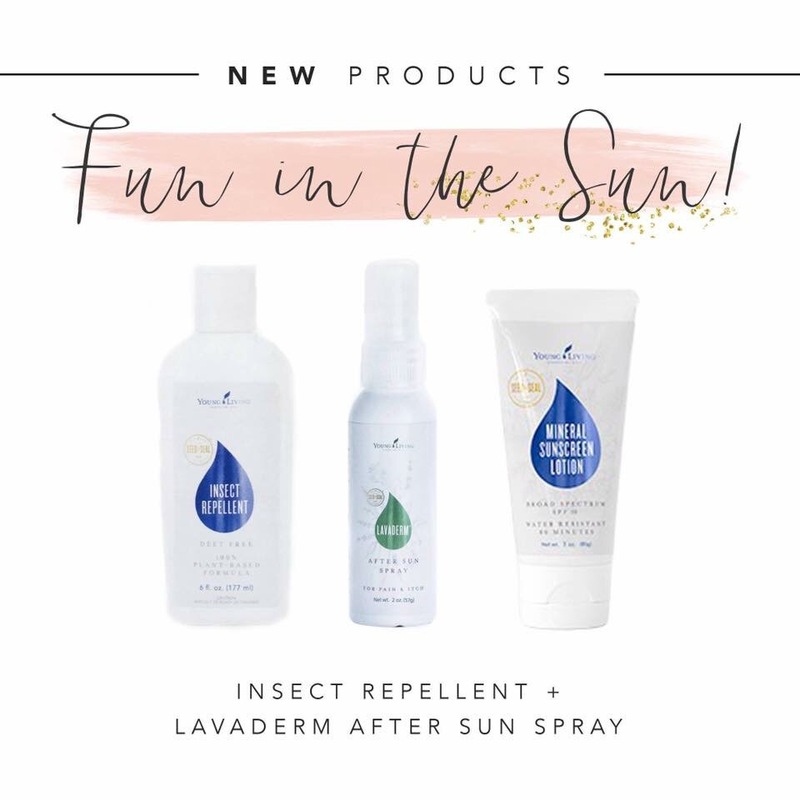 It is so relaxing and peaceful, and it already comes with carrier oil in the bottle as part of the Kidscents line—perfectly formulated for use on littles (although adults like it too!). Roll on the bottoms of their little feet before bed, and/or down their spine. 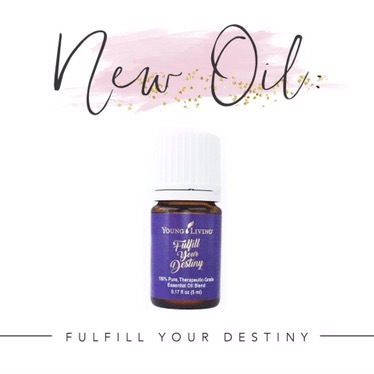 It is so lovely and calming, and is such a great oil to use for sleep training! Diffuse it at night, and add it to rollers for topical application. This is an oil that invites a sense of calming for both baby and adults alike! It is a blend of some of the dreamiest oils, including rose, lavender, lemon, roman chamomile, geranium, ylang ylang, jasmine, and palmarosa. That is pretty much pure magic in a bottle! Diffuse it and make a roller of just Gentle Baby for a dreamy nap and bed time experience. I do 4 drops cedarwood, 4 drops orange, 4 drops lavender, and 3 drops vetiver, and fill the rest with carrier oil in a 10 ml roller. It is seriously the best!!! Good for baby and mama! It’s great to start with a calming blend in the evening as you begin your bed time routine and are getting ready to settle down. We also love to diffuse overnight as we sleep. It is such a wonderful support to everyone’s sleep. 5. How early on can you start using EO’s on baby? Staring at day one you can start, however some prefer to wait a week or two until both baby and mama have figured out a few things like nursing. Mama’s own scent is very important for baby in those early days! I started at around two weeks old for my son. Here is a good guideline for ages and dilutions. 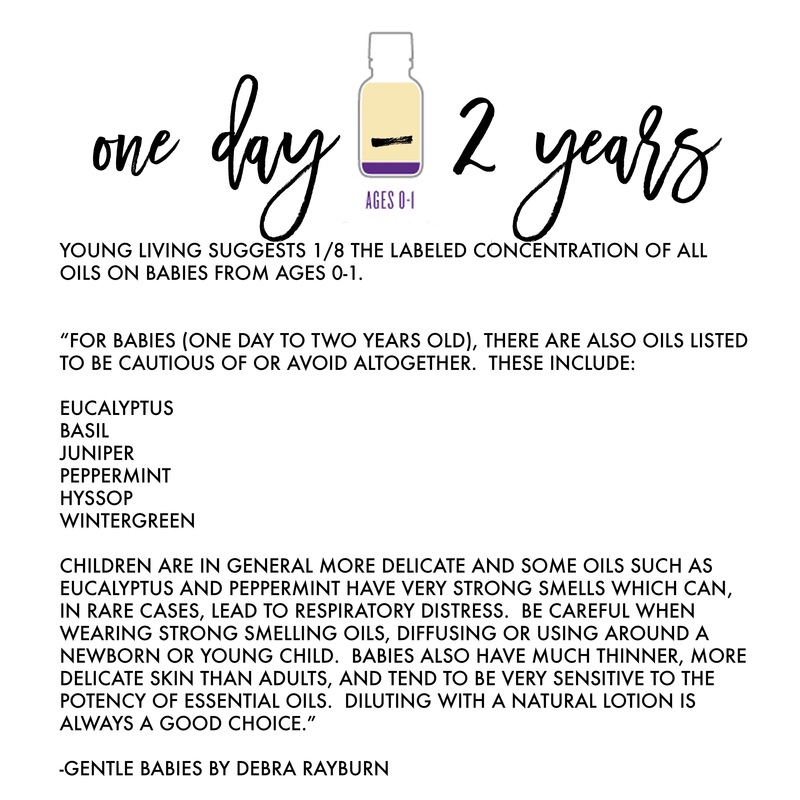 Young LIving suggest ⅛ the labeled concentration of all oils on babies from ages 0-1. 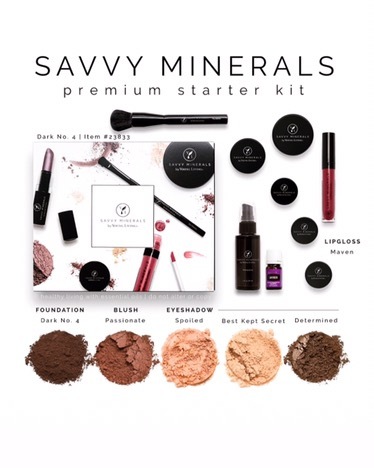 Be sure to reference the safe list below to avoid oils not suggested for use under two before using a blend or single. Young LIving suggests ¼ the labeled concentration for children ages 2-6. Using carrier oils and lotions is also a great way to extend the use of your bottles! It’s great when you’re on a “mama” budget! Using oils neat or undiluted will create a tendency for the oil to evaporate more quickly. Using a carrier oil or lotion may also create a more sustained effect and reduce possible over-sensitivities especially in this age group. Young Living suggests ½ the labeled concentration for this age range. When starting with oils, use one at a time always diluted to avoid overloading their system. Slowly start to add in oils as they adjust. This is a great age for kids to start using their own blends. Mix up their favorite oil for school or the oils that you use on them daily in a roller bottle and send them on their way. Be sure to teach them oil safety and to apply oils to the feet first and always diluted. Young Living suggests full labeled concentration for kids ages 12+. At this age, kiddos will be use to applying oils and what oils is needed and when. Be sure to teach them oil safety first and to start applying to the feet first. Be aware of “Hot” oils such as Peppermint, Panaway, Thieves and Oregano. Hot oils feel icy/hot to the touch. This can cause irritation on the skin and these oils should always be avoided around the eyes. Be sure to not rub the eyes or around the eyes after applying hot oils. We always suggest diluting hot oils no matter the age. Diluting is “watering down” the potency of essential oils which is key for babies. Their skin is much more delicate so diluting is just what we do. It also helps stretch your bottle of oils. My favorite carrier oils to dilute with are fractionated coconut oil or avocado oil for rollers and regular (solid at room temp.) coconut oil for massaging onto my son’s skin. 7. Which EO’s are helping during teething? COPAIBA! 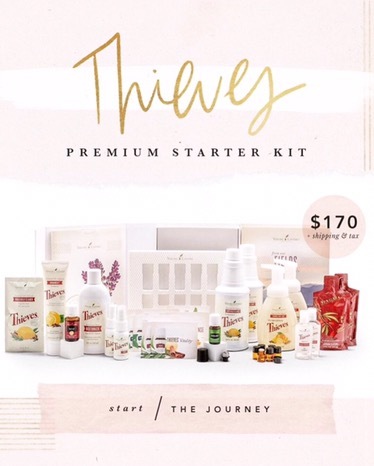 This oil comes in the starter kit! This oil is a MUST for teething! 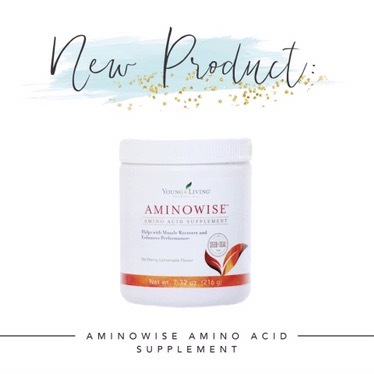 It has anti inflammatory properties and helps the body’s natural response to injury and irritation. It helps numb the area it’s applied to and is known as the “Firefighter” putting out fires so to speak. Use it by itself or with clove. I made my son a roller with Copaiba and Clove topped off with FCO in a 2 ml roller and we use it when needed for teething relief. 8. 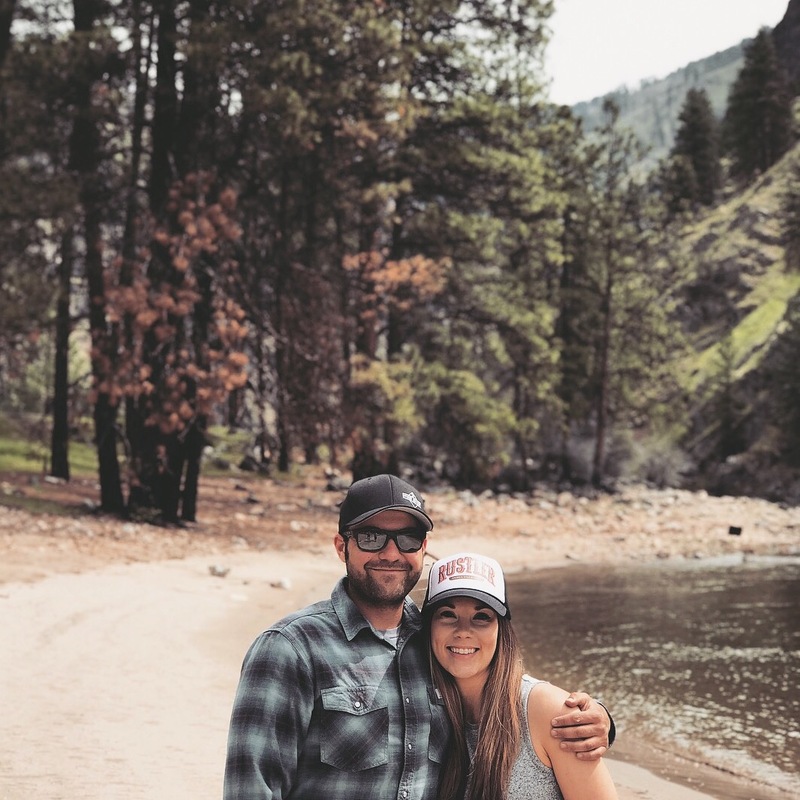 Can EO’s help with seasonal yuck? 9. Can EO’s be harmful if not used properly? 10. 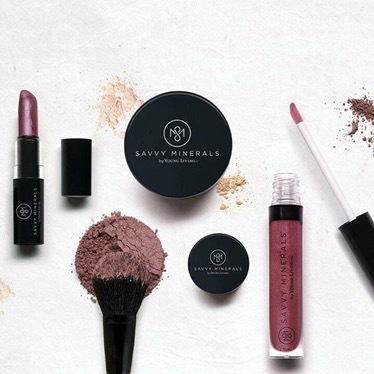 Which EO’s brand do you recommend? Why? Have a question I did not cover? Let me know! While I was pregnant I stocked up on cloth diapers and tried to learn as much as I could about the laundring process. 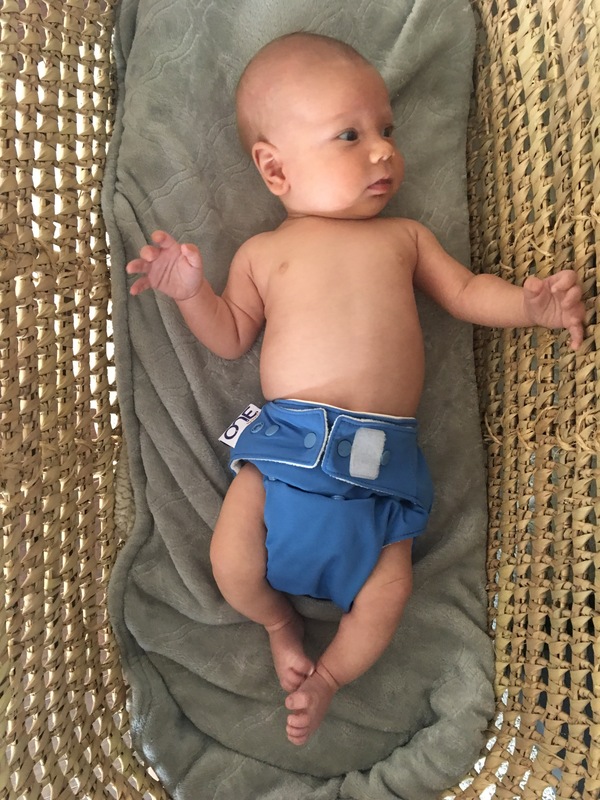 My son is now four months old and we do not use cloth diapers all the time. I have however learned that cloth, specifically Grovia ONE diapers are the only diapers that prevent leaks in the middle of the night. I guess he’s a heavy wetter, I’m not really sure. With multiple brands of disposable diapers he would leak by morning. I have tried several brands of diapers, environmentally friendly ones and cheap ones. Our favorite right away were Honest Company diapers, I mean those prints are just so stinking cute!!! Another brand that I would say (just by researching) is comparable to Honest is Parasol Co. I however have not tried Parasol Co. so if you have let know what you think! Our diapers of choice as of now are Thrive Market brand. They are made of natural materials, not bleached and are very absorbent. The only down side is that they don’t have cute designs, but you’re saving almost 50.00 a month compared to Honest Co. so I like that! You get 144 diapers for 31.99, pretty good deal for a more natural non toxic, chemical free, chlorine free, latex free and sustainably sourced material diaper. 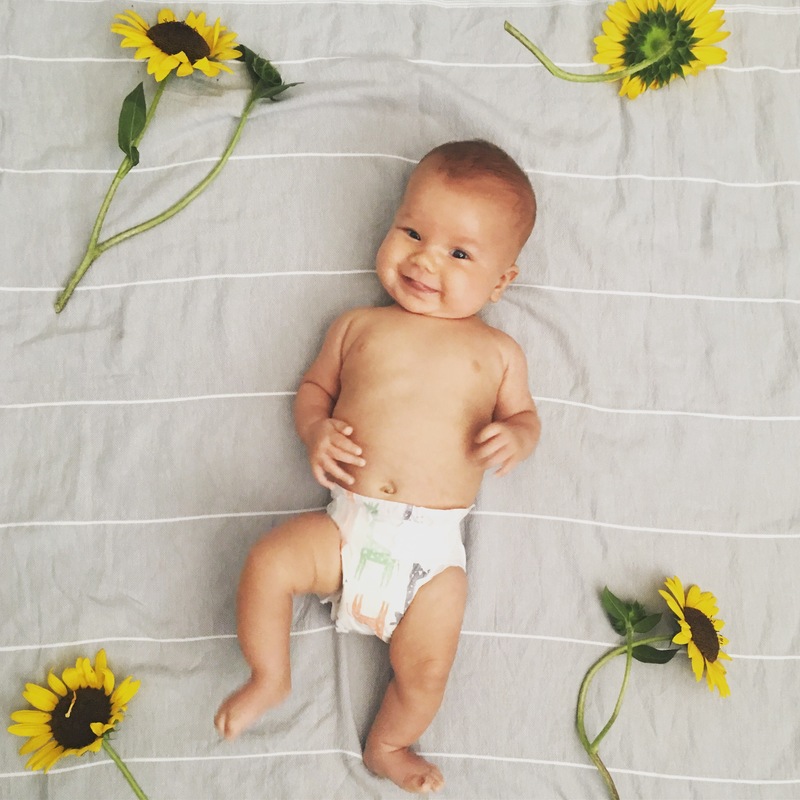 Want to try these diapers for your little one? 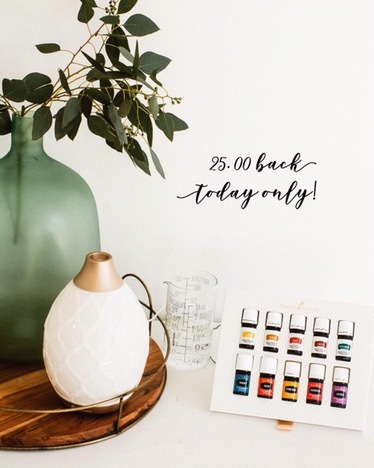 Use this link to get 25% off! Let me know what you think of these diapers! 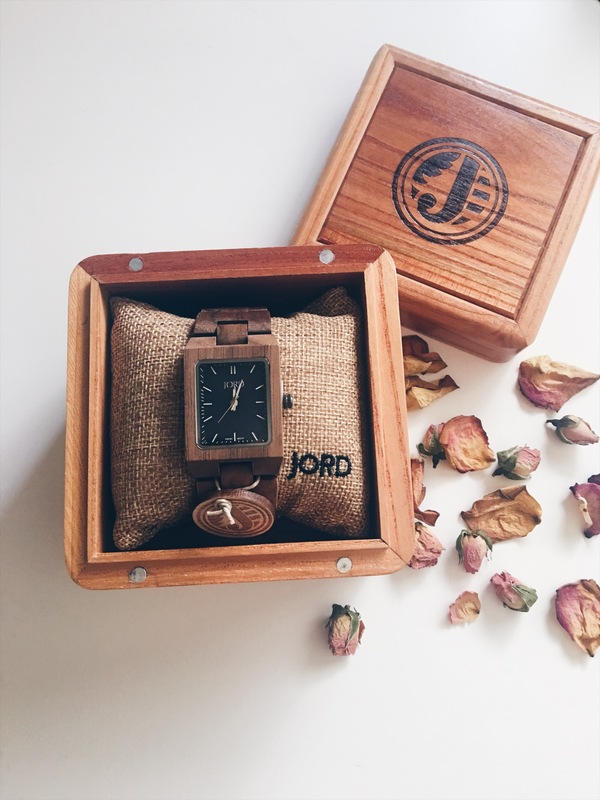 Have another brand you love? Tell me! 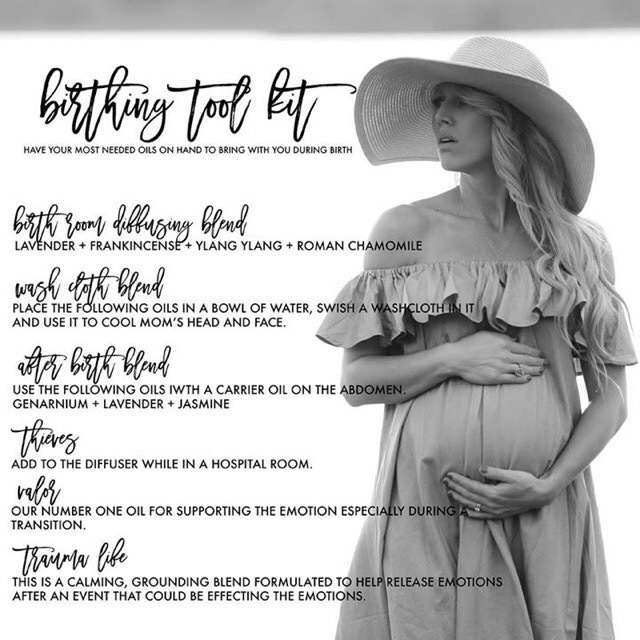 Moving on from Pregnancy I wanted to share some oils that were helpful to me during labor. In my hospital room my sister was my saving grace, she made sure the diffuser was full and always running. My favorite combo was Stress Away and Valor! Seriously couldn’t have made it without those two! A cool washcloth applied to my forehead was oh so nice too, I had my sister add lavender to the washcloth for an extra calming effect. In early labor at home I applied Sclaressence to my ankles to help with contractions and it seemed to help alleviate some of the pain in the beginning of it all. 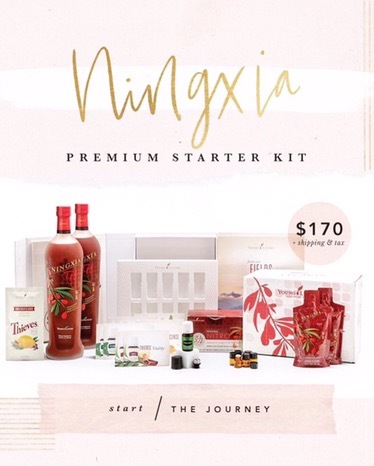 After delivery and the few next days I drank all the Ningxia! 2-4 ounces a day is all you need and I definitely appreciated the extra energy and mental clarity it provided! Love it! I feel like it helps with milk supply too so keep that in mind if you’re needing to up your supply. I started using Progessence Plus about 10 days after giving birth and I honestly can say it has kept me fairly level considering all the hormone changes my body is going through. Progessence Plus supports your hormones with wild yam extra which is a natural progesterone. It also contains, balsam fir, Frankincense and a few other emotional supporting oils, it smells divine, light and woodsy.